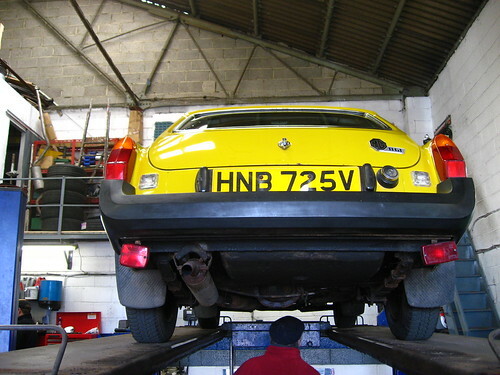 Today the MG passed its MOT - it's first for about 20 years! The morning was not without incident however. During our morning shakedown to get it prepped for the test an old issue reappeared. On turning the key to the ignition, the starter kicked in and kept going. This has happened once before and we couldn't work out why - in the end it fixed itself, but we knew it'd return, though we'd hoped not on the morning of its first test! When it happens the only thing to stop it is to pull the lead off the battery, otherwise the starter just keeps on turning. It seems to be a fault in the key cylinder as with the battery off, a few turns of the key in the cylinder seemed to have fixed it for now. This'll be something we tackle shortly. As to the test, the only advisory we got was to keep an eye on the rear brake lines (the only ones we haven't yet replaced) which is something we were looking at doing anyway as we already have the piping. Now to get it taxed and give it a few short runs to unearth any minor niggles!